We had a hunch this would happen when Time Warner Cable unceremoniously gave customers two-weeks notice that they would soon be paying a monthly modem rental fee for equipment that was already installed — the cable company is now a defendant in two identical lawsuits filed earlier today. The suits, filed in the Superior Court of New Jersey and the Supreme Court of New York, allege that, among other things, TWC violated its own Terms of Service by not providing enough notice to customers about the fees. The plaintiffs also claim that TWC told customers they could avoid the fee by using a modem they purchase, it failed to inform customers about the possible problems of using a personal modem — like not being able to access TWC’s phone service. The flimsy postcard, seen above, is at the heart of many of the allegations in the lawsuits. First, it was sent out too close to the start of the fee, claim the plaintiffs. 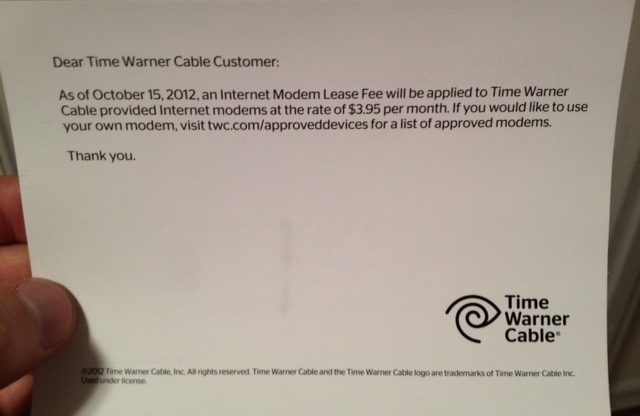 Unless otherwise provided by applicable law, Time Warner Cable will notify you 30 days in advance of any price or service change. Notice of these changes may be provided on your monthly bill, as a bill insert, as a separate mailing, in the Legal Notice section of the newspaper, on the cable system channel(s) or through other written means. While we suppose that a plain white postcard might count as “other written means,” or a “separate mailing,” the plaintiffs say that TWC failed to do its best to make sure that all customers were notified of the upcoming change. The biggest concern is whether or not these cases will get their day in court, as TWC recently updates its subscriber agreement to include a forced arbitration clause that would seem to negate any attempt to bring a class-action against the cable company. But Wittels points out to Consumerist that Section 15 (b) of the TWC subscriber agreement states that “claims for injunctive orders or similar relief must be brought in a court.” [italics for emphasis] And since the case is seeking an injunction against TWC’s modem fees, he argues that the company’s own agreement compels this to go before a judge. The complaint says that even though TWC is allegedly pulling in $40 million a month from these fees, the individual monthly payments are so small, “it makes no financial sense for an individual customer to challenge the monthly surcharge, aside from the fact that many customers don’t even realize they’ve been defrauded. A TWC rep declined to comment on the suits.